RIM-7H:1973, Modified from RIM-7E to perform better on ship. Used by NATO. RIM-7M: 8 cell MK29 box launcher, and can be launched from vertical launch systems. Role and Mobility Medium-range surface to air missile. 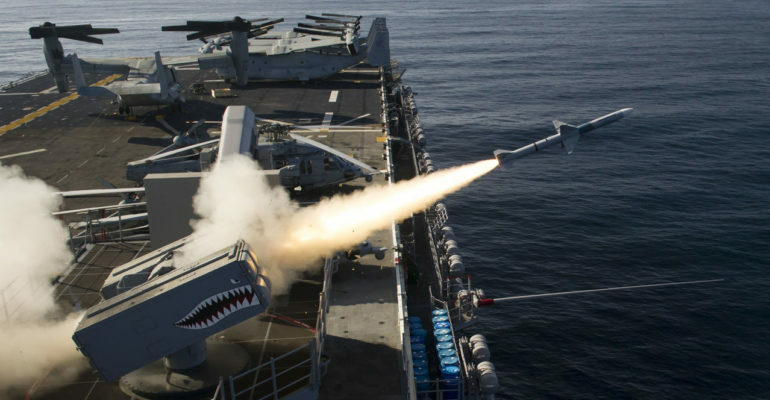 The RIM-7 Sea sparrow is a short to medium range, radar-guided, surface to air missile. [vi] It was developed as a joint project by Raytheon and General Dynamics. [vii] Initially designed as an air-to-air missile by Sperry and the U.S. Navy, the RIM-7 was modified and now serves as an air defense system for the U.S. Navy. The RIM-7 has gone through multiple upgrades. [viii] The current version is the RIM-7P, an upgrade of the original RIM-7M, which provides better capability in engaging low-flying aircraft and “sea-skimming missile”, such as cruise missiles. [ix] The RIM-7P was largely the predecessor of the Evolved Sea Sparrow Missile (ESSM). [x] The RIM-7P is used by NATO allies, as well as other U.S. allies around the world. The RIM-7 defends U.S. naval ships from such threats as enemy aircraft, high speed low altitude cruise missiles, as well as standard aircraft missiles. This capability allows the U.S. Navy to enter hostile and contested territory where adversaries may be attempting to push an anti-access/area denial (A2/AD) strategy. Current actors engaging in an A2/AD strategy are China in the South China Sea and Russia in the Baltic Sea. The RIM-7 Allows U.S. naval forces to enter the contested area with the confidence to defend its vessel should either actor turn hostile. 1964: The concept of the RIM-7 is first looked at as a variant of the AIM-7 air-to-air missile. 1994: the RIM-7P enters service.